I love posting about STEM (Science, Technology, Engineering, and Mathematics) and some of the great resources, products, and software that we can use to better prepare the next generation of little techies. The 8 year old (recently 7, now barely 8) has been playing with littleBits lately and having a blast. He loved SnapCircuits so littleBits seemed like a reasonable, if slightly higher-level, option. SnapCircuits boldly has kids as young as three or four creating circuitry from a simple light and switch all the way up to a solar-powered radio or a burglar/door alarm. It doesn't hide the complexities of volts and amps and includes low-level components like resistors. Frankly, I wish my first EE (Electrical Engineering) class in college was taught with SnapCircuits. LittleBits (usually a lowercase L) jumps up a layer of abstraction and includes motors, motion detectors, LED arrays, and lots more. 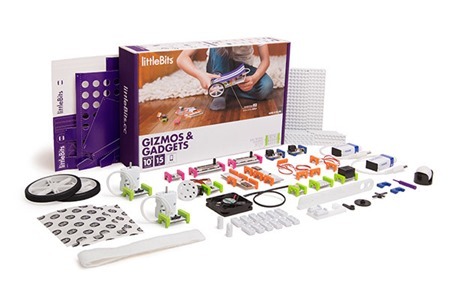 There are also specific kits for specific interests like a littleBits Musical Electronics Synth Kit and a littleBits Smart Home Kit that include specific littleBits that extend the base kit. 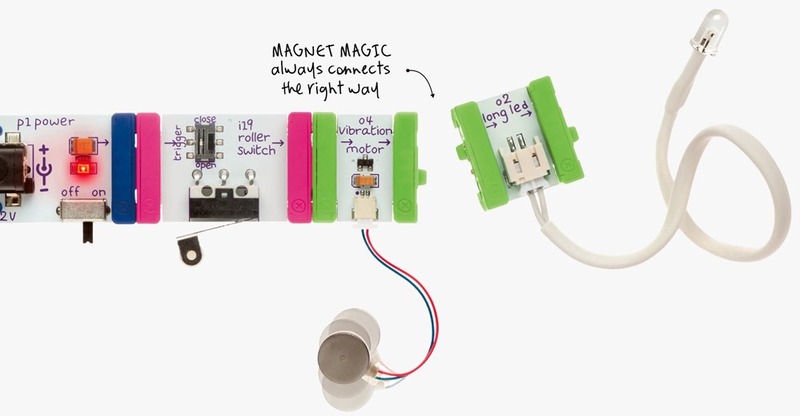 The key to littleBits is their magic magnet that makes it basically impossible to do something wrong or hurt yourself. The genius here is that the magnet only goes one way (because: magnets) and the connector underlying transmits both power and data. You start with a power bit, then add an "if" statement like a switch, then move to do a "do" statement like a motor or light or whatever. In just about 20 minutes my 8 year old was able to take a LEGO custom Star Wars Blaster and add totally new functionality like lights and sounds..
One of the aspects of littleBits that I think is powerful but that wasn't immediately obvious to me is that you shouldn't be afraid to use glue or more permanent attachments with your projects. I initially tried to attach littleBits with rubber bands and strings but realized that they'd smartly included "glue dots" and Velcro as well as 3M adhesive pads. Once we stopped being "afraid" to use these stickers and adhesives, suddenly little projects became semi-permanent technical art installations. We got the "Gizmos & Gadgets" kit which is a little spendy, but it includes 15 bits that enables you to do basically anything. The instructions are great and we a had remote-controlled robot that could drive around the room running within an hour. It's a great setup, a fun kit, and something that kids 8-14 will use all the time. *Amazon links are referral links on my blog. Click them and share them to support the blog and the work I do, writing this blog on my own time. Thanks! I remember playing with stuff like this when I was a kid (but not quite as simple). I can't wait till my kids are old enough so I can teach them stuff like this. Thanks for sharing Scott. Reminds me of the Science Fair 100 in 1 Electronic Project Kit I had when I was a kid. I think it was my uncle's. Ultimately, it was my first step in becoming an engineer! I just received a raspberry pie 2. I'm familiar with windows 10 development so I was going to load that but I was wondering if there might be something easier for my son who's 11 to code and play with the raspberry pie? "STEM Kids" makes it sound like they have some sort of deformity. I wonder if my nieces and nephews could be interested in computers and science without being stuck with this label? If you're a STEM kid, can you also be an Art kid or vice-versa? If so, what does it actually mean to be a STEM kid or an Art kid? Is it the same as just being a kid? It sounds even funnier when you unwind the acronym - "Will all the Science, Technology, Engineering and Math kids please report to the auditorium? Everybody else can go do some Art or PE because you're obviously too stupid to be interested in cool things like Science, Technology, Engineering and Math!" I'm a committee chair for the newly minted STEM committee in PTA. I have a few events lined up, but am looking for ideas on how to add on either this, or in subsequent, years. I'm having difficulties finding resources targeted towards younger kids, but I'm sure there's a way to get them excited, if nothing else, about STEM subjects. @Eric - the CamJam Edukits for the RaspberryPi are very good for kids. I got two kits for my own son - the Sensors (£7) and Robotics (£17). He really liked the kits, and I think they are good value for money. The instructions are very clear, you can view them on the website to see what you think. We've finished the Sensors kit, so starting on the Robotics kit next. Hi Scott, where is the "Scott Hanselman's 2016 Ultimate Developer and Power Users Tool List for Windows". Has the list not changed from 2014's ?